Point of sale solutions are about as diverse as the businesses they serve. This stands to reason, since businesses vary in size, scope, location, products, services, management styles, customer base, and many other factors. Point of sale symtems include a synthesis of both hardware and software, and coming up with the right blend for a particular business model is no simple matter. Those in the POS industry know this, and so there is naturally an attempt to create avenues for helping businesses make good decisions and find the support they need. It is helpful to know how this works. Point of sale manufactures create hardware, such as all-in-one POS terminals, bar code scanners, keyboards, cash drawers, pole displays, and receipt printers. Frequently manufacturers will specialize on certain POS hardware items, such as APG Cash Drawer and MMF POS for cash drawers, or Epson for receipt printers. inventory control, reporting capabilities, managing customer data, and much more. It is common for developers to customize their POS software for various industries, such as retail, grocery, liquor stores, salons, and others, since these business types can have very different needs. Some software developers choose to work directly with businesses to create cost-effective and customized solutions, doing without the distributor/VAR chain. Some developers focus on providing online POS solutions based on cloud technology, so that the point of sale software can be used more independently of hardware restrictions, and accessed from a POS station, computer, laptop, or smartphone. POS distributors act as liaisons between manufacturers and VARs. 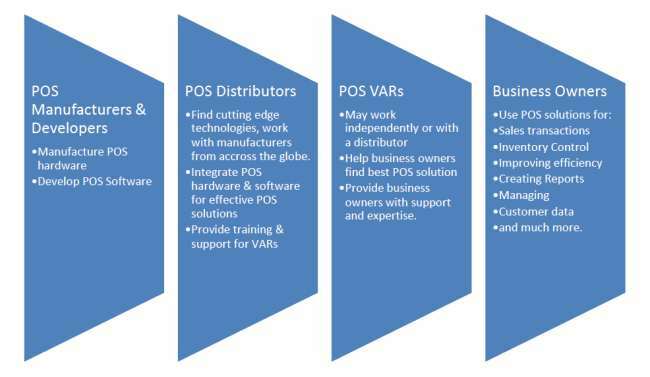 Large distributors such as BlueStar and ScanSource are poised to find and work with the best manufacturers of POS hardware from across the globe, many of whom offer innovative and cost-effective technology but are not set up to work directly with VARs or businesses efficiently. By working with manufacturers, the distributors help to reduce costs, and improve products with product testing and product support. The distributor’s relationships with POS software developers provide the benefit of customer leads for POS VARs. Other benefits that distributors offer to resellers include training for products, technology and business, sales support and advertising assistance, and trade shows for education, exposure, and networking. They can also provide technical support, such as testing software compatibility with POS terminals, as well access to an extensive inventory. The effective installation of a point of sale system involves a ten billion dollar plus industry with numerous players adding value at every stage. End-users of a POS system, and certainly their customers, may not see or appreciate the tens of thousands of people involved, but they are there, in the background, helping to make it happen. The local reseller may be a two person, or fifty two person operation, but they are ultimately backed by companies from modestly sized software developers to multi-billion dollar distributors and layers of expert industry personnel, all working to insure a smooth and seamless POS installation.